These are American Bartenders School techniques for preparing mixed drinks recipes, building, stirring and shaking. These techniques are the same ones that our students learn in the bartending school class. These cocktail drink videos show the proper technique and explain when and why cocktail drink recipes are either shaken, stirred or build. Learn how to make hundreds of popular mixed drink recipes at American Bartenders School. Read the reviews posted online by our students and call to become a bartender today! Pour into the required glass the heaviest liquid first. Place a bar spoon (or teaspoon) upside down into the glass against the edge. Slowly pour the next heaviest liqueur over the back of the spoon. Continue with each liqueur, ending with the lightest. Jigger: A two sided measuring tool with different measures on each side. They come in various sizes. Cocktail Shakers: Use for blending ingredients in cocktails and mixed drinks. There are two types. The easiest to use is the three part shaker consisting of Metal mixing cup, strainer and measure cap. 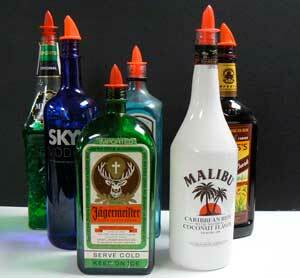 The 3 part shaker come in various sizes depending on how many drinks you want to prepare. The second type is a Boston shaker that consist of a metal mixing cup and a glass mixing cup. Bar Spoon: Use to stir ingredients in a mixing cup or in a tall glass or mixing cup. Strainer: Fits in the shaker or mixing cup and used to remove the ice from a mixing cup or cocktail shaker. Corkscrew: Use for opening wine bottles. Ice Bucket: A metal or insulated ice bucket will keep your ice cold and clean. Ice Tongs or Scoop: Use to add ice to drinks. Never handle ice with your hands, it’s not hygienic. Don’t use glassware as an ice scoop, the glass could easily break in your hands. Electric Blender: Use for drinks with fruit pieces, cream or ice cream. An electric blender will smoothly blend thicker ingredients together. Cutting Board: Use for cutting fruit with sharp knife. Glasses come in various sizes. These are the basic shapes of the most popular cocktail drink glassware. Lean how to make hundreds of the most popular cocktail drink recipes at our drink recipe page. American Bartending School’s liquor dictionary gives a brief definition of the most popular distilled spirits and describes many of their flavors. Whiskeys vary in alcoholic strength, from 110 proof American bottled in bond whiskey, to 70 proof Canadian whiskeys, sold only in Canada. Most whiskeys sold in the United States are either 86 or 80 proof, depending on the distiller and brand. Prior to the 1960s, most whiskeys were bottled at a higher proof. Today, modern drinkers prefer lighter-tasting whiskeys. Federal law requires that the label on each bottle be plainly marked with the proof of the liquor. Proof indicates the amount of alcohol in any distillate, and represents 50 percent alcohol by volume. The term “proof” came out of the pioneering era of distillation. In the beginning, to determine the strength of liquors, distillers would mix equal quantities of the spirit and gunpowder and then apply a flame to the mixture. If the gunpowder failed to burn, the spirit was too weak; if it burned too brightly, it was too strong. However, if it burned evenly, with a blue flame, it was said to have been proved. Hence the word proof. Pure alcohol, like the kind used in laboratories, is 200 proof, being 100 percent alcohol. A combination of half alcohol and half water is scored as 100 proof or 50 percent alcohol. Proof is a measure of alcoholic strength, not necessarily of quality. American whiskeys are rigidly defined by law, and gov­erned accordingly. They include bourbon, corn, sour mash, Tennessee, blended, straight, bottled in bond, and rye. The history of American whiskey and America parallel each other. Whiskey was an integral part of everyday life in the Colonial days. It helped comfort the settlers during hard times and was enjoyed at the end of a rough day. It was also used to cure snakebite, ward off disease, and ease pain both superficially and internally. Brandies are produced wherever grapes are grown. Cognac comes from France, and Metaxa is from Greece. Brandies produced in California must be made from California grapes, and they have to meet rigid standards set by the distillers. California brandies account for over 75 percent of the brandy sales in the United States. It is important to understand that all cognac is brandy, but not all brandy is cognac. A brandy may only be called cognac if it is distilled from wine made of the grapes that grow within the legal limits of Charente and Charente Inferieure Departments of France. Brandies distilled from wines other than these are not legally entitled to the name cognac, even though they may be shipped from the city of Cognac. Rums can be broken down into various classifications. The light-bodied ones are dry and have only a very light molasses taste. They are available in two varieties: white, which is by far the most popular, and gold, which is a mixture of light and dark. The gold is sweeter and has a more pronounced molasses taste. The two favorite light rums come from Puerto Rico and the Virgin Islands. Another classification is heavy-bodied rums that are much darker and sweeter. They have a pungent bouquet and a heavy molasses taste. The dark rums differ because of slower fermentation and special maturation processes. Well-known dark rums come from Jamaica, Demerara, Martinique, Trinidad, Bermuda and New England. Tequila, the primary spirit of Mexico, has its own special flavor that is almost tart and leaves the tongue clean and tingling. In the 1970s, tequila became the fastest growing spirit in sales, as vodka did in the 1960s. Tequila is obtained from the distillation of the fermented juice (sap) of the mescal plant, called pulque. The only source for Tequila is the mescal plant, which is a species of the agave plant. It is a cactus that takes between twelve and thirteen years to mature. Its long leaves, or spikes, are cut off at harvest time, leaving only the bulbous central core, called the pina, meaning pineapple. The pinas, which weigh from 80 pounds to 175 pounds each, are taken to the distillery where they are cooked in pressure cookers for several hours. They are then cooled and shredded, and the juice is pressed out. The fermentation process is completed in huge wooden vats. The fermented juice is then twice distilled in traditional copper-pot stills. Black currant flavored liqueur . When people first begin ordering wine it is easy to be confused with the type of red wine available. Shall I have the “Red Bordeaux” or the “Cabernet Sauvignon”? For all you know, you could be having the same wine! The problem is that some wine producer’s name their wine after the region where the grape is grown and others based on the variety of the grapes used. A simple rule is that wine from France and most of Europe is named after the region. Wine from the United States, Australia and other non-European countries are named after the grape. I have included only the most popular types of grapes. Where it is produced: Bordeaux, California, Washington, Australia, South Africa, Chile, Argentina, Italy, Romania and Bulgaria. Characteristics: Known as the “King of Red Wine”, it is the most popular red wine grape to date. Its color is medium to dark red with usually strong tannins. When grape is young, it has a vegetal aroma – mint and green bell pepper. With greater maturity, it develops softer tannins with strong flavor of blackcurrant. The good wines aged longer and may develop chocolate, leather, tobacco, lead pencil or cedar aromas. Where it is produced: Bordeaux, California, Washington, South Africa, Chile, Argentina, Italy, Romania and Bulgaria. Characteristics: Often used as a grape to blend with the Cabernet Sauvignon grape, Merlot is increasingly gaining popularity on its own. Its color is medium to dark ruby with usually soft tannins. It has rich and ripe plumy fruit flavor with a fruity lingering aftertaste with a hint of vanilla. It is best drunk young. Where it is produced: Burgundy, Alsace, Germany, California, Oregon, Italy, Switzerland and New Zealand. Characteristics: It is the grape that is used to make great Burgundy wines. Its color is light to medium red with soft tannins, usually dry with a suggestion of sweetness. Aroma and flavor varies from region to region. In France, it is earthy with hints of roasting coffee, prunes or plums. In California, it may have a berry-like aroma of cherries or vanilla. Drink it when it’s young. Characteristics: Known as either Syrah or Shiraz, this grape allows wine-makers to vary in style from light to full-bodied and in taste from mediocre to great. Its color is usually dark red with high tannins. The aroma and flavors can vary from fruit flavors (strawberry, cherry or raspberry) to vegetal flavors (roasted green peppers), meaty flavors (smoky bacon) to spicy flavor (black pepper). The best wines can age well. Where it is produced: Beaujolais and Loire Valley in France. Characteristics: A light-hearted and friendly wine, which has helped, drawn many drinkers into red wines. It is more popularly known as “Beaujolais” than by the name of the grape. Its color is light to medium red with soft tannins. It is surprising fruity and fragrant with grapey or strawberries flavors. Most wine makers try to maintain the youthful, light-bodied, low alcohol style which followers have grown to like. Definitely drink it young. Characteristics: An increasingly popular wine in the US that has a pink version called the “White” berry bouquet, sometimes peppery or earthy. Moderate tannin and acidity. Good, full-bodied Zinfandel can keep. Where it is produced: California, Central Italy, and Argentina. Characteristics: The grape that is used primarily for the popular Italian wine called “Chianti” (Key-ahn-tee). Its color is medium ruby red with low to medium tannins. It has an earthy and smoky aroma though some may exhibit an aroma of cherry fruit . Has a slightly harsh and bitter aftertaste. The good ones can keep up to six years. Where it is produced: California, Italy (Piedmont). Characteristics: The grape that is used for Italy’s finest wine – Barbaresco (Bar-bear-esk-o), Barolo and Gattinara (Ghatt-een-ah-rah). Its color is dark red and is tannic and acidic when young. With age, it becomes rich and dry and is usually full bodied. It has an earthy and pungent aroma with suggestion of leather or licorice. Often with a bitter aftertaste. Can age well. Where it is produced: Spain, Portugal, and Argentina. Characteristics: Used to make great Spanish wines such as the Rioja (Ree-o-ha), Pesquera (Pess-care-ah) and Vega Silica (Veg-ah Si-sil-yah). Its color is deep red with moderate tannins. It has a pepper and vanilla flavor although its aroma is often masked by the blending with other grapes. Although red wines are probably more popular for wine lovers, most us begin drinking white wine first. The major difference between red and white wine is the absence of tannin, which gives you that harsh or astringent taste when you have too much of it. That is the reason why white wine is enjoyed chilled. Like red wine, there are many different types of grapes used for white wines. We review the most popular. Where it is produced: France, US, Australia, South Africa, Chile, New Zealand and many other places. Characteristics: Known as the “King of White Wine”, it is currently the most popular white wine grape. Its color is pale to straw yellow and its aroma can vary from region to region. In cooler climates, there are hints of apple, citrus, butter and vanilla whereas in the warmer climate, the aroma swings toward melon and tropical fruits. It is usually oaked and is full bodied and toasty with moderate acidity. Where it is produced: Bordeaux, Loire Valley, US, Australia, South Africa, Chile, New Zealand, Italy and many other places. Characteristics: Also known as Fumé Blanc, this grape is a popular blending grape for Bordeaux wines. Its color is light to medium yellow with a tinge of green. It has a grassy bouquet like the smell of a freshly cut lawn. May also display scents of lemons, asparagus and fig. Where it is produced: Vouvray, Anjou, Saveuniéres,Saumur, Steen, US. Characteristics: Used to make many different types of wine – sparkling, dry and sweet wines. Its color is usually pale to medium yellow and may vary from dry to semi-sweet and sweet with moderate to high acidity. It has a honey aroma with scents of hay as well. Where it is produced: Bordeaux, Australia, South Africa and Chile. Characteristics: The grape is well known in France for making the sweet wines of Sauternes although in other parts of the world, it is made as a dry white wine. It is also a common blending partner with the Sauvignon Blanc in Bordeaux. Its color is light to medium yellow. Its aroma is slightly grassy with a hint of lemon. With maturity, it develops nutty, buttery and toasty scents. The wines from Sauternes have honey-like bouquet and are sweet. Where it is produced: Alsace, Germany, US. Characteristics: This very distinctive grape is found in limited regions but is gaining some popularity. Its color is medium yellow and it has a strong bouquet of fresh roses and lychee fruit. It is often a soft fat wine and can sometimes be spicy. The best Gewürztraminers are found in Alsace and Germany. Characteristics: Also known as Muskadel. Is also often confused with the Muscadet (Muss ka day) grape used in the Loire valley in France. Used to make types of dessert, sparkling and dry white wines. Its color is medium yellow and it has a strong flowery, perfumey, fruity flavor that is very distinct. Where it is produced: Alsace, Germany, Austria, US, Australia and Canada. Characteristics: Also known as Rhine Riesling or Johannisberging in some parts of the world. It is pale straw color. In Germany, it is often made a sweet dessert wine. Its aroma has suggestion of lemons, flowers and pineapples. Where it is produced: Alsace, Germany, Italy, Austria, US. Characteristics: Also known as Pinot Blanco in Italy and Weissburgunder in Germany, Pinot Blanc belongs to the Pinot family of grapes. Its color is pale yellow with suggestion of honey, apples and rich tropical fruit. Tends to be dry crisp and full-bodied. Characteristics: Also known as Tokay D’Alsace or Pinot Grigio. It is yellow in color and has a dry, rich, full-bodied, pear-like taste with creamy texture. It has a smoky or musky aroma though you may experience some buttery flavor with apricot overtones. Where it is produced: France, Italy, Portugal, South Africa, and Argentina. Characteristics: Also known as Frascati or Orvieto. It’s color is water pale-to-pale straw and is usually light bodied, dry, crisp and fruity. Often used as a blending grape as well. It has a rather neutral aroma or faint nutty bouquet. Not all wine should be served at the same temperature. Depending on the body and flavor of the wine, one should vary the temperature as recommended in the chart below. Chill the wine in a bucket of ice and water for 5 to 10 mins. Many red wines might recommend being drunk at the “room temperature”. However, it is wise to know that our room temperature is often not the room temperature where the wine is produced or labeled. Hence, a little chilling is necessary. Decanting is often necessary for the older wines or heavier reds to remove the deposits in the bottle. To decant, stand the wine for a day and slowly pour the wine into another bottle or decanter. Ideally, do it in front of a lamp and stop when you see the deposit. Decanting also allows the wine to “breathe”, which will help soften the harsh tannin of the wine. Most red wines don’t need to breathe before serving. Don’t bother uncorking the wine and let it stand to breathe. The amount of wine which comes in contact with the air is minimal. It is better to pour it into a wine glass to let it breathe. Glasses for red wine tend to be larger than white wines glasses. Champagne should be served in a flute glass whenever possible.